Chris Wood in action at Derby before injury meant he missed last week's game at Middlesbrough. With the rugby posts back down at Elland Road it is back to home games for Leeds United as they bid to turn round their poor recent record at the ground when up against Birmingham City on Saturday. The Whites have failed to win at home since March 4 with their run of failings now adding up to nine matches with five to finish last season and three draws and a defeat so far this term. 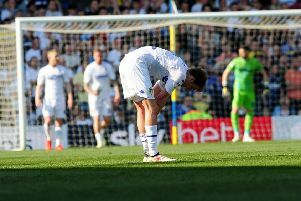 They have come close to ending that unwanted run several times this season, but have yet to put in a convincing 90-minute display at Elland Road with a pattern developing of improved second half displays after wasted first 45 minutes. Another bad start cost United when they went down 3-0 at Middlesbrough last Sunday when they conceded in only the third minute and they have trailed in the first half of home matches with Sheffield Wednesday, Brentford and Ipswich, a trend they must stop quickly if they are to climb from their present mid-table position. Whatever the reasons for the slow starts, once they get a foothold no-one has yet outplayed United, however, so there is certainly light and shade and they were unfortunate to go on to lose by a three-goal margin at Middlesbrough as the division’s highest scorers were kept to just two efforts on target all game and were gifted two goals. Giuseppe Bellusci’s own goal when there was no communication with goalkeeper Marco Silvestri who had the ball comfortably covered gave Boro their second and an equally comical goal ended the contest late on when United’s other central defender, Sol Bamba, slipped to give Diego Fabbrini a clear run in on goal. The opening goal was the result of poor defending too as Charlie Taylor was too easily beaten by Christian Stuani and Bellusci could have done better to cut out his cross, but allowed David Nugent plenty of time to bring the ball down in the box and fire into the net. It was a surprise to see Bellusci in the starting line-up in place of Liam Cooper, who has been Leeds’ most consistent defender so far this season and the decision certainly backfired for head coach Uwe Rosler, who was not too impressed with the Italian defender’s display on his return to the team. Rosler’s tinkering with the team after they had won at MK Dons was another surprise, although Gateano Berardi was one of their better performers and fully justified being back in at right-back and Jordan Botaka showed the odd good touch on his debut on the right-wing. There was no choice up front with Chris Wood injured. His replacement, Mirco Antenucci, battled well to get Leeds going despite the lone striker role not being one he is best suited to, and was denied a perfectly good goal at 2-0 when incorrectly given offside. Rosler will want Wood back, nevertheless, for this Saturday’s game and his team selection will be interesting after the Boro defeat with Cooper, Sam Byram and Luke Murphy all looking to get back in the starting line-up and another winger, Will Buckley, signed on loan. Visitors Birmingham have made a decent start to the campaign and stand one point and five places above Leeds, but they are also coming into the game off a loss after surprisingly going down 2-0 at home to Rotherham last Saturday. Rosler, meanwhile, has been backed by owner Massimo Cellino. He said: “This coach is the best person for me and for the team. “If someone gave me the chance to change, I would take this coach and these players because we have something good here. This guy, he is professional. I like him more than any coach I had here before. “He needs help, he needs help to relax a bit and to let the players relax, but believe me I’m going to let this work.